Usually, ISIS beheads people. But in this video, a member got beheaded himself. 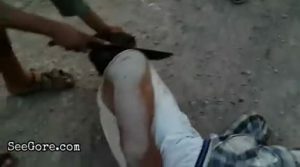 ISIS beheads men with sword quick and clean. Five men were put in cage by ISIS and lowered into water. Video by ISI where a man executed with an M4, splattering his brain. ISIS slaughter a man that was hangeing upside down and then slay another guy. 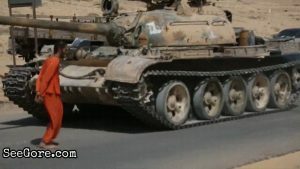 A man horribly flattened by a tank started from his feet up to his head. 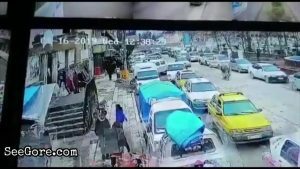 CCTV recording shows a suicide bombing attack that killed a few people including Americans. These captives were tied with explosive on their neck and were blown up. These spies were uncovered and got beheaded as punishment.